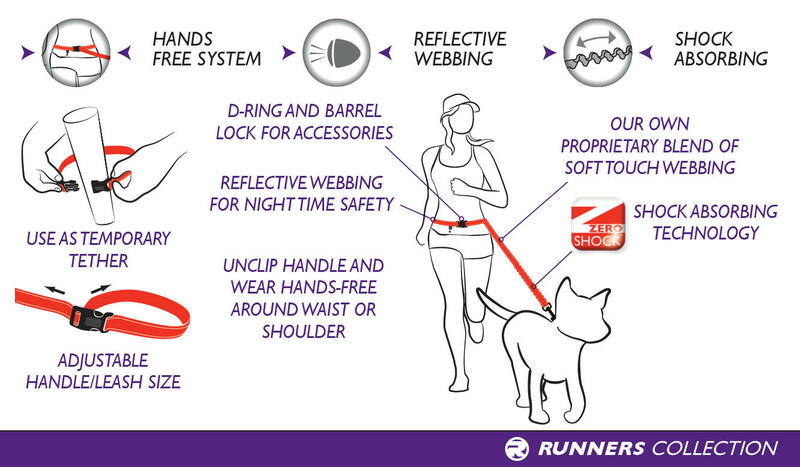 The Road Runner is the ultimate hands free dog walking/running experience. The sliding side-release buckle allows you to alter the length of the leash or unclip to wear it around your waist, shoulder or hand. The incorporated Zero Shock Technology is the advanced shock absorbing component in the center of the leash that cushions and eases the pressure for both the owner and the dog. With the use of a sliding side-release buckle, the size of the handle can be extended - allowing you to set your own length. The use of this buckle in the handle means it can also be unclipped, so you can wear the leash around your waist/shoulder or use as a temporary tether. 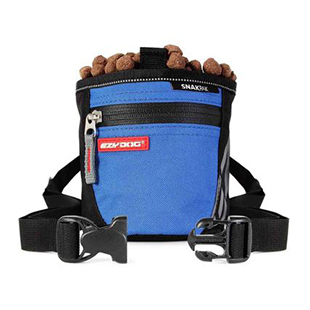 Built into the handle is a D-ring and a barrel lock, ensuring you can attach your favourite accessories when using the leash as a running belt. 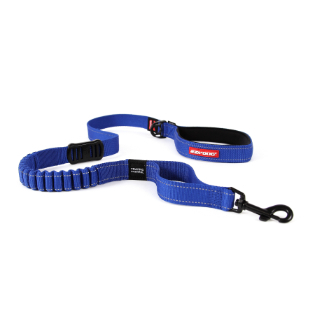 The RoadRunner leash is made from our own EzyDog blend of soft touch webbing, making it the most comfortable, strong and durable dog lead on the market. The handle also is lined with neoprene making it extra soft to hold in your hand. When used as a hand held leash the length is 6.5 ft. I love this leash; just bought a second for our new dog. Ezydog makes quality products but I love the function of the leash as well. Our dogs are trained not to pull, but when you come up to a situation on a busy trail and you're moving at speeds faster than a walk, the leash comes in handy with the little bit of recoil it can offer. I also use the leash when I'm running with the jogging stroller. Again, although my dogs are trained, I'd rather have them "attached" to me, not the stroller--for the safety of my children. Thanks EZYDOG! Wow i can heat a hoagy, talk on the phone, play cards, play, baseball, and still have my best friend next to me.... I love this product and how different and simple it is designed compared to other running leashes. I am training a Russle/Pitt and she is learning to run with me as i run with my other dog. Ezy dog things of nearly everything. the clip is clever and the waist can fit almost everyone i think. it can even go around your shoulder should u have a bigger dog. For my 60 lbs super hyper active dog it even helps her drag me down the street almost effortly. First saw this in use with my sister's dog. I liked the weight, the stretch feature, and close control loop. The one aspect of its design I would like to see changed is the ability to close the loop smaller when using as a handle. For my hand it is still too big and there's a tendancy for the leash to slip out off. This leash is beautifully sewn and constructed. My new dog and I love to hit the trails for early morning runs. I feel so much safer with him tethered to my waist, rather than holding a leash in my hand. I love how this is a longer leash plus the additional stretch saves my arm when a cat, dog, or squirrel come along and my dog thinks she needs to catch it. great product so far; my suggestion would be to have one more expandable area or perhaps one of more length for dogs that like to run out n front. That might help with the potential of the handler getting hung up in the slack in the event the dog slows down. Well made. I am looking forward to using more. I am in a wheelchair and I thought that this would make things so much easier for me. I love this leash I just wish that it came in smaller sizes I have a 6 lbs Bolognese, yes he pulls, just like other dogs do. but the leash is a little heavy for him, he walks a little to the side when we use this leash, but that does not stop me. If you could make this leash for smaller dogs I think you would have more than just me purchasing them. Small dog market is sometimes forgotten and we have the same problems and large breed owners, just something to think about. I would be the first one to buy a leash for a smaller breed made like this. EzyDog says: Thank you so much for your review, we greatly appreciate your feedback. We will pass this along to our R & D team. Love this leash as I have used it to walk a single dog, added it above my waist to add a 4th dog (the neighbor's) walking with us (I usually walk 3 golden retriever around my waist using a skijorring belt with Ezydog attachments) and have used it with one dog as I get up on the dock to jump my dog for dockdog events. I have had to go the waist for dog walking and dockdog events secondary to tennis elbow issues. Love the stretching end, but would love to have a handle on it like the coupler does so I could pull the dog back if needed to keep her from going ahead while stopped (before crossing the street, while we wait to get on the dock, etc.). Have recommended it to other runners/walkers with dogs. Love the Ezydog products that we own. great leash and it fits me!